With the vast majority of switchgear manufacturers using air or Sulphur Hexifloride (SF6) as their insulating medium in both the bus-bar chambers and circuit breakers it is of the upmost importance to note and record the degradation of the insulating medium for various reasons. One very important reason is that SF6 whilst it is an excellent insulating medium can extremely damaging to the environment and the health of the people surrounding it’s use. SF6 pressure is recorded at switchgear commissioning time so that should there be an abnormal level of gas released between FAT testing and the completion site it can be noted investigated and corrected prior to handover. It is also important that the quality of gas is recorded so that the insulating medium is up to the levels required by the switchgear design. The EiUK – PGS40 is a test calibration pump used to generate pressure and a vacuum for checking, adjusting and calibrating mechanical & electrical instrument by way of comparative measurements. 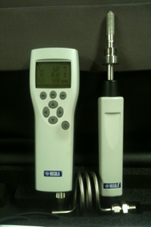 ​The Visala DM70 is designed to sample and test the dew point of SF6 Gas. The device has many capabilities and offers a fast response time measurement result in less than 10 minutes. Measurements are made on site via the various attachments. There are also various measurement parameters – Td (Dew-point Temperature), Td calculated from gas pressure to atmospheric pressure, PPMw, & PPMv, & Temperature, all of which can be logged and reported to PC.